Book Review Find a Fallen Star By Regine Petersen Reviewed by Adam Bell Meteorites, like all natural phenomena, remind us of our fragile state. The bulwarks, both real and imaginary, that we erect to protect us are often flimsy and can come crashing down at a moment’s notice. Piercing our atmosphere, the rocks descend to the earth, landing in the ocean, in far-flung fields, or in our backyards — they remind us of chaos that swirls outside our thin atmosphere. Find a Fallen Star. Photographs by Regine Petersen. Meteorites, like all natural phenomena, remind us of our fragile state. The bulwarks, both real and imaginary, that we erect to protect us are often flimsy and can come crashing down at a moment’s notice. Piercing our atmosphere, the rocks descend to the earth, landing in the ocean, in far-flung fields, or in our backyards — they remind us of chaos that swirls outside our thin atmosphere. Regine Petersen’s multi-volume book Find a Fallen Star presents three cases involving meteorites and the affected communities and individuals. Blending appropriated archival imagery and text along with her own photographs, Find a Fallen Star offers a free ranging exploration of each incident, as well as a portrait of our fraught and imaginative relationship to celestial events. Find a Fallen Star. Photographs by Regine Petersen. Kehrer Verlag, 2015. Handsomely housed in a gray box with an ominous image of a meteorite on the cover, each chapter of Petersen’s multi-volume work reflects on the mythologies woven around a rare, but scientifically unremarkable event. The first and strongest book, Stars Fell on Alabama, recounts the earliest instance, and involves a woman who was actually struck by a one of two meteorites that landed in Alabama in 1954. It crashed through her roof, bounced off her radio, and hit her. An African-American man living nearby discovered the second rock. In Stars, the rocks not only become pawns in a contested struggle for fame and fortune, but also highlight the lingering disparities of racial inequality in the region. Fragments, the second volume, tells a story from 1958 when a meteorite landed in a field in Germany and was found by several children. Broken apart and later reassembled, the meteorite and its history reveal the ways a simple rock can refract cold war paranoia and fuel adolescent fantasies of the vastness of space. 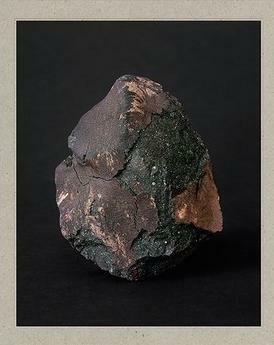 The final book, The Indian Iron, involves a meteorite that landed in a field near a small village and nuclear power plant in Rajasthan, India, in 2006. Discovered by two men, the final chapter is the most opaque of the three and offers oblique allusions to Hinduism, via an epigraph from the epic religious poem the Raghuvamsa, a painted shrine to Hanuman, and numerous monkeys, both alive and stuffed. It’s hard to know what the religious connections might be, as the main text, an interview with several witnesses, is inexplicably left untranslated from its original Hadoti dialect. There are fragments of English, but mostly we are left in the dark. Later, an email exchange appears between two German scientists who question the meteorite’s authenticity and serves only to highlight their own arrogant bias and skepticism. Although the Rajasthani context for the book is certainly the most foreign to Petersen and most Western audiences, not translating the text feels like a convenient excuse not to let the witnesses speak for themselves, and delve more deeply into the context and culture surrounding the incident. In reality, the largest concern, at least by the Indian government, was the meteorite’s proximity to a nuclear plant, which, had it struck the plant, would have caused untold damage. Petersen works in the now popular style that blends archival imagery and text with personal, subjective imagery. The porous boundary between the affect and contextual meaning of these two different, but actually often similar types of imagery, can be intriguing and fertile territory. For each book, Petersen visits the original location and combines photographs of the surviving people involved, landscapes, and more pointedly ambiguous imagery, like a luminous puppy resting in the dirt, a striated mountain of soil, or a burst of smoke enveloping a tree. Throughout the three books, certain images, like those of animals, reappear—frogs float in water, or crawl through the mud or dirt, donkeys stare impassively at the camera, and a solitary snake emerges from the shadows. Empty fields, solitary meteorites, and the night sky are among the other reoccurring images. Subtly suggestive, Petersen’s images hint at her overarching story and highlight the way natural facts or observed moments can refract and offer moments of wonder and awe that match the extraordinary celestial events at the book’s core. However, in her reliance on the original stories and continual use of archival imagery, Petersen seems reluctant to let go of all the facts or original story. After all, there’s an amazing story to tell; rocks cascading from space and lives disrupted. While Petersen strives for mystery, she always returns to the facts — letters, newspaper clippings, or archival imagery — rather than moving outward to explore her subject. A few more lies wouldn’t hurt.